Al Capone. Winston Churchill. Meyer Lansky. Fidel Castro. Ernest Hemingway. Mitch Garvis. These are just a few of the famous, infamous, and unknown people from the past century who have sat on the patio of the Hotel Nacional, ordered a drink (mojito for some, whisky for others, a cerveza Cristal for me), and lit up a puro – a pure Cuban cigar. I was first introduced to the Nacional a few years ago, and sitting where I am now – in a wicker couch with plush cushions in a rich red, back to he hotel, facing the fountain (which I cannot say for sure has ever founted), I feel like I am in heaven. Beyond, past a hundred metres of patio, the gardens which unlike most such gardens are equipped with two 280mm cannons and bunkers, last manned in the last century, but dating back to pre-independence Cuba and the Spanish American Wars. They point out over Habana Harbour, and have gratefully been silent for over fifty years. The Nacional has a great history, which like so many things here includes glamour, opulence, gangsters, American Imperialism, and Cuban pride. Built in the 20s, in the heyday of American gangsters it was briefly a Pan American hotel, and ten percent was owned by Meyer Lansky (who convinced then Président Batista to give him ten percent, plus control over the hottest casino in this part of the world). That all ended, of course, with the Cuban Revolution of 1959, as was portrayed in the movie The Godfather Part II. The gangsters, the casino, the American influence and ownership disappeared virtually overnight. The incredible architecture remains… along with the Salon Parisien. As I sit out enjoying the view (and the company of my amazing and patient Liza), I thought it only appropriate to light one of my favourite cigars – a Cohiba Madura 5 Genios. As I light it I can immediately taste the bold flavours that remind me of he strength and resilience of the Cuban people. 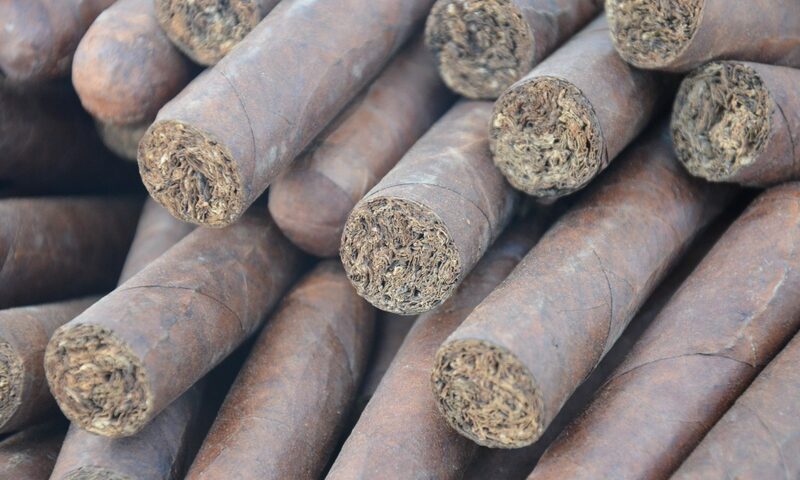 It is a strong cigar that is not for the faint of heart. It has a peppery taste, and the retrohale has quite a kick. It tickles my throat and my nose, and I can imagine that we’re this one’s first cigar they might not enjoy it. This evening there is a cool breeze that cuts the heat and sometimes overwhelming humidity of the air, and comes off the harbour like a pleasant and welcoming visitor. Tomorrow morning the breeze will be stayed, the heat will return, and I am sure I will seek the air conditioned comfort of a lounge in between exposures and long walks in the musky air. Before I lit my cigar, we decided to order a quick bite. While more expensive here than elsewhere, he tuna sandwich is quite good, and will keep us both satisfied for the evening. I forgot to ask them to add cheese, but that was my fault. In the hotel there is a LCDH, along with another great cigar roller (Lazaro). I generally enjoy his robustos, which unlike my other rollers he sells in packs of five. They are definitely worth a try. We arrived to the store after hours, so I will have to return another day. The store is on two levels. Upstairs they sell bottles of rum; as you walk to the stairs you pass the rolling table, and downstairs is where the cigars are. It is a long store, with the counter on one side, the glass-walled storage area along the other. Because so many big-wigs spend time here it is rare that they have anything other than the standards (I do not have the same relationship with the staff here that I do with others, so they don’t give me access to private stock). Nonetheless, you can always get a good box of Montecristo or Trinidads. I do not consider it a special store, which is too bad because the rest of the hotel really is. You can smoke there, but because the patio is nearby I never have. In the garden there is a tree stump that was not here when I last visited. It is the remnants of a large tree that was felled by Hurricane Irma in September, 2017. During that terrible storm – the worst in over a century – the Nacional sheltered over 700 stranded tourists. The storm damage is apparent in some places, but like the Cuban spirit it was fixed and made better after the tragic event. What will be the next storm that hits? Will it be meteorological or political? The joie de vivre of the Cuban people hide that they know it is always coming, in some form or another, and they must be ready to face it, endure it, and overcome it. During the many festivals I am amused watching the older foreigners coming here to show off with their young Cuba girlfriends – many of whom look barely old enough to drink, and who so often sit looking bored as their boyfriend/patrons drink, smoke, and tell each other stories of finance, business, and fishing. I hope I never feel I need to have a 19 year old trophy on my arm to feel impressive, but I try to never judge a man until I have walked a mile in his shoes. I do pity the women though, every one living in a country of poverty and scarcity, who are lucky to be able to use their fleeting youth and looks to help support their families. What it must be like for them to be exposed to such opulence, only to return home to their shanties where families often share the same house between three generations or more. There have been so many changes to the hotel, which has seen the rise and fall of American influence and gangsters, communism, the fall of the Soviet Union, and more. Will the casino ever reopen? I don’t know. What I do know is that since I started coming I have seen a swell and then shrinking of American tourists, happy they were able to start coming, many now fear coming for their current president’s bluster and whims. My strong suspicion is that the Nacional, along with the rest of the island, would be better absent the influence of the strong Cuban ex-pat community lobby of South Florida. Without that, the island might begin to once again thrive in the post-Castro era. The six story hotel overlooking the Malecon is definitely worth a visit, and it is impossible to miss while walking or driving along that magnificent boulevard. The architecture is impressive, and it’s location on the hill overlooking the harbour amplifies its grandeur. Don’t miss it… but don’t buy your cigars from the bar here. They are real and only slightly overpriced, but the selection is not nearly as good as the mojitos.